Whether you’re an animal lover or not, this is one story that’s bound to leave you smiling from ear to ear. You may not have realized it, but if you’ve ever eaten at Boston Market, then you’re supporting the ethical treatment of animals. Because instead of sourcing its food from those nightmarish, inhumane factory farms like so many of their competitors, Boston Market just announced that it has no idea where its rotisserie chickens come from. Amazing! It’s nice to see a company that puts animal welfare first. Forget those farms with disgusting conditions and cages that are far too small, because every morning, chicken meat in unmarked, damp paper bags just shows up at all 500 of Boston Market’s U.S. locations. No one has a clue where any of the rotisserie chickens that Boston Market sells come from, which means less money in the pockets of those cruel factory farmers, and that’s a huge step forward for animal rights. Wow, you’d be hard-pressed to find a business that’s more animal-friendly than Boston Market! The badass fast casual chain has proven that you don’t need to rely on unethical farms to run a successful restaurant. 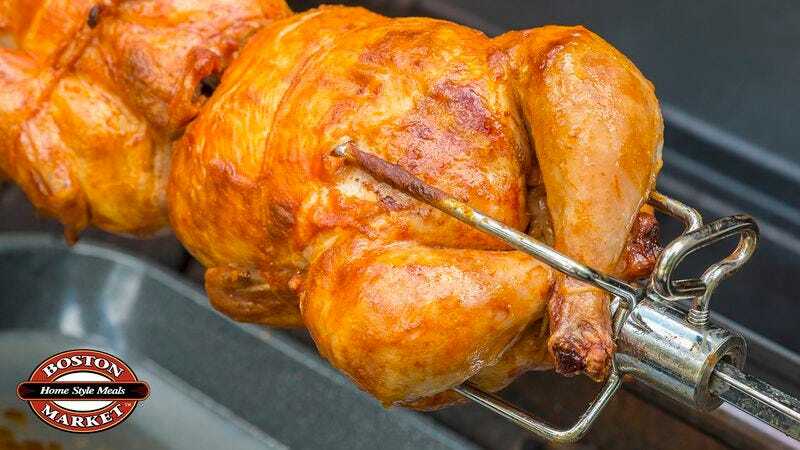 Because no one affiliated with Boston Market is making purchase orders for the shipments of loose chicken that just mysteriously shows up, Boston Market is able to keep the price of its rotisserie chickens low. And consumers can feel great knowing that they are getting value and eating something with a completely opaque, unknowable origin. You go, Boston Market! Your total lack of knowledge as to where your product comes from is a major victory for animals everywhere! Keep up the good work!